What will be the net charge on an object which attracts neutral pieces of paper but repels a negatively charged balloon? This is College Physics Answers with Shaun Dychko. If a charged object repels a negatively charged balloon, it means that the object must have negative charges. But how do we square that with the idea that it attracts neutrally charged, well, it's kind of a contradiction of terms to say neutrally charged, I mean to say neutral, neutral pieces of paper? Well, a negatively charged object near neutral pieces of paper will cause a polarization in the pieces of paper and it will cause a charge distribution to happen, such that the electrons are repelled to the far side leaving protons on the near side. And this positive charge on the near side and the negatively charged object will attract each other. 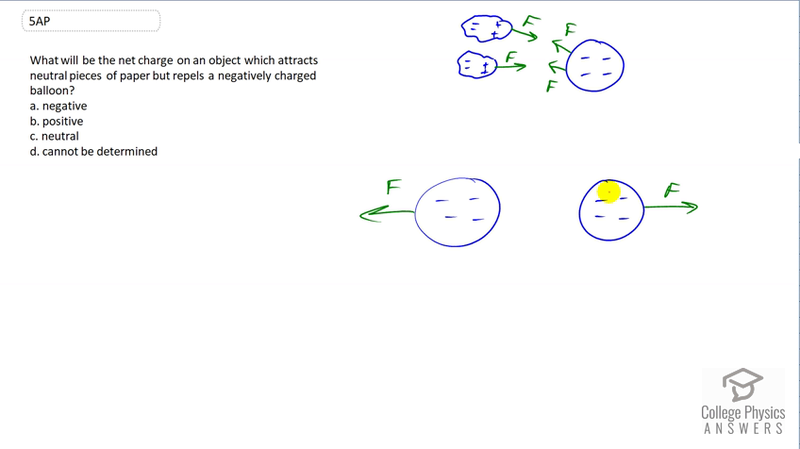 And so, this object definitely is negative because it repels a negatively charged balloon. And it also makes sense that it can attract neutral objects. So that answer is a.